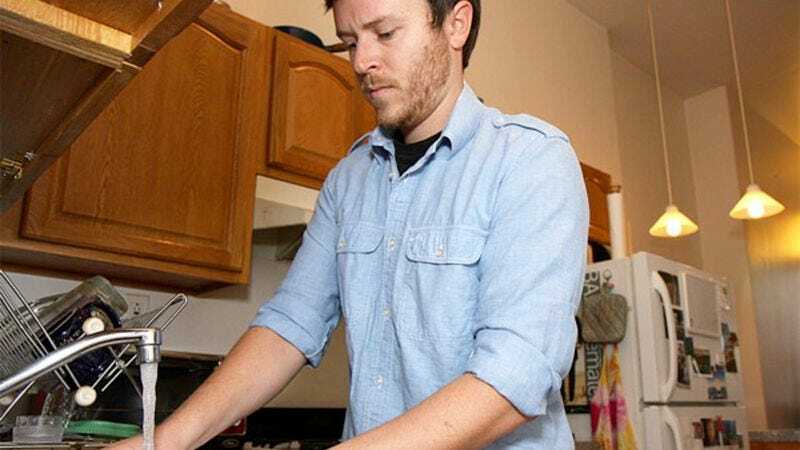 JACKSONVILLE, FL—Briefly overcoming a near-continuous streak of disorganization, area man Terry Oberlin, 37, got his life together for exactly 36 minutes, sources confirmed Monday. According to family reports, Oberlin's bills for the month were paid, the living room was vacuumed, the dishes from dinner were all washed and put away, and the father of two was sitting in his favorite chair in the living room without a single thing in his life out of place. "It was nice to get some chores out of the way," Oberlin told reporters later, acknowledging that for more than half an hour he experienced no regrets, despair, or frustration of any kind. "Felt really good." The crucial worry-free period reportedly began at 7:50 p.m., when Oberlin took the garbage out to the curb and then returned to the house, where his back, which had been bothering him all day, finally cracked back into alignment. Upon entering his kitchen, he spotted a month-old magazine sitting on the counter where it didn't belong, and dropped it into the garbage. At that precise moment, sources said, Oberlin achieved a state of total order in his life. Witnesses indicated that upon entering into his relaxed state, Oberlin—who had no e-mails to respond to and was finally caught up with everything at the office—spent a full 90 seconds staring quietly at nothing in particular, and then approximately 8.5 minutes paging leisurely through the evening newspaper. During this period, he did not once concern himself with his finances, his in-laws, or his dental coverage. And as his mind began to wander freely, he neither relived painful humiliations from his past, nor felt any anxiety about his personal shortcomings. "He really seemed to be taking it easy," said wife Kay Oberlin, noting the pronounced absence of a deep furrow from her husband's brow. "He had his feet up on the ottoman." She added that on Sunday her husband seemed greatly pleased to have found the time to change the oil in his car and mow the lawn, and that during dinner Monday evening he appeared relieved upon hearing the news that the wine stain on his good white shirt had come out in the laundry. Oberlin spent the remainder of his temporary period of tranquility watching the first 26 minutes of House M.D. Monday's incident marks the first time the 37-year-old has had his life in order in more than six years. In 2003, he experienced a moment of complete inner peace that spanned a brief minute and 15 seconds, lasting from the time Oberlin finally got around to removing the training wheels from his son Tyler's bicycle to the time the boy rode it off a curb, requiring a trip to the hospital for a few stitches. "Luckily our insurance covered most of that," said Oberlin, recalling the accident and how it made him realize that, even though he had a decent health plan, his policy wasn't going to cover the cost of his children's orthodontic needs, and that if he wanted to send them to college he really needed to find a way to start contributing to their 529 funds while still keeping up with his mortgage. "And fixing the bike only took the better part of a Saturday." Household sources reported that Monday's 36 minutes of perfect order came to an end when the phone rang and Oberlin picked up the extension in his living room. It was his mother-in-law, calling to say their family vacation plans would have to be changed, since her best friend Gwyneth had just been hospitalized. "So then I had to deal with that," Oberlin said. "Which was fine, I'm not complaining. I expect I can catch the rest of that episode of House on a rerun sometime."